Mumbai: Earnings growth of Indian companies has picked up pace in the three months ended 31 March after demonetization of high-value banknotes in 2016 and implementation of the goods and services tax (GST) in the following year disrupted business activity for several quarters. An initial review of earnings reported so far indicates profit growth has accelerated. 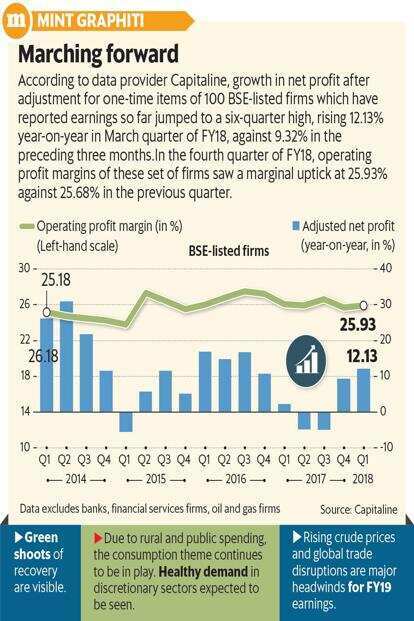 Profit growth after adjustment for one-time items of 100 BSE-listed firms that have reported earnings quickened to a six-quarter high of 12.13% in the March quarter from a year earlier. That was faster than the 9.32% pace in the three months ended 31 December. The government’s stress on affordable housing and higher minimum support price (MSP) for farm produce ahead of several state and national elections over the next 12 months are expected to support consumption demand, analysts said. A normal monsoon, as forecast by the weather department, this year will also boost growth, they said. Operating profit margin of this set of firms widened marginally to 25.93% in the fiscal-fourth quarter from 25.68% in December quarter. Although Brent crude prices surged 3.98% in the January-March period, raw material costs declined. Total raw material costs was at 8.69% in the March quarter from 9.21% in the preceding December quarter. “Companies would have used up older inventories and started negotiating for passing on increased costs. The real impact will be seen in Q1 (first quarter) of FY19 numbers," said Deepak Jasani, head of retail research, HDFC Securities Ltd. The earnings review excludes banks, financial services firms and oil and gas firms. “March quarter numbers have so far been in line to better than our expectations. The green shoots of recovery are visible," said Siddhartha Khemka, head of research (retail) at Motilal Oswal Financial Services Ltd. He expects fourth quarter earnings for fast-moving consumer goods (FMCG) and consumer durables to be better than last year. Firms such as Hindustan Unilever Ltd and ITC Ltd have not reported their March quarter earnings. “We are seeing signs of consumption revival. Q3 saw some of the consumer firms reporting double digit volume growth in last many quarters. Q4 is likely to be even better as the growth in the economy is likely to boost consumption," Khemka added. According to Jasani, consumption growth will get a boost from rural spending and also if monsoon turns out to be as good as predicted. The government’s weather office India Meteorological Department (IMD) has said rainfall is likely to be normal during the June-to-September southwest monsoon. IMD will update its forecast in early June. Brokerage Sharekhan, owned by BNP Paribas SA said there is an improving demand performance and outlook in several key sectors. "On account of rural and public spending, the consumption theme continues to be in play. Hence, healthy demand in discretionary sectors such as auto and retail is expected to continue just like the previous quarter," it said in a report on 12 April. Projection of a normal monsoon in 2018, pick up in investment cycle, industrial capex and improving demand add to the positive news but rising crude prices and potential global trade disruptions are key challenges, the brokerage firm added. “The early numbers have been a mixed bag. While metal, cement, chemicals have seen results surpassing expectations, banks, housing finance, fertilisers and IT (information technology) sector have produced results that are mixed. Sugar has disappointed as expected," Jasani said. The March quarter earnings so far have largely been in line with expectations except for the non-performing assets (NPAs) of banks, said Vinod Karki, vice-president (strategy) at ICICI Securities Ltd. “We have seen encouraging commentary coming in on the capex revival with robust volumes and improving capacity utilisation for cement along with overall infrastructure (roads, metros, airport construction) and affordable housing showing traction. Large cap IT continues to drag earnings for Nifty although the midcap and small cap IT companies boosted earnings of their respective groups," he added. However, despite a slight pickup in earnings growth there has been no significant change in earnings estimates. Bloomberg data shows Nifty firms’ consensus earnings per share forecast for the current fiscal has been cut by 1.16% from beginning of this fiscal; for 2019-20, it has been cut by 0.8%. The 50-share Nifty now trades at 17.76 times 12-month forward earnings.